Having tried a lot of different rowing machines I’m convinced the best budget rowing machine for home use is the Concept2 Model D. In fact this is one of the best selling rowing machines in the world and for good reason. To be fair I’m a relative newcomer to the world of rowing, that’s why I was so keen to find the best budget rowing machine. My journey started when I complained to a friend about the difficulties of keeping my running and cycling schedule going in the winter months. The obvious answer was an exercise bike and a Treadmill. But then my friend pointed out the benefits of the rowing machine and the fact that it takes up less space than multiple machines. 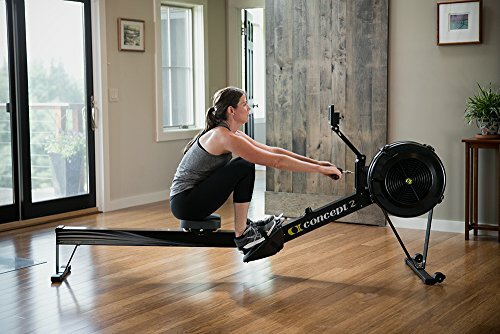 As soon as I tested his I knew I needed my own one; it took several months of testing every machine I could get my hands on before I realized that the Concept2 Model D was the best budget rowing machine. Rowing machines work all of your legs, specifically the quads and hamstrings. You’ll also feel the benefit in your glutes and, of course, your arms, shoulders, upper back and lower back! But a rowing machine doesn’t just help boost the strength in your whole body. It is also hard work; your heart rate will climb as you get a great cardiovascular workout. In turn this will improve your calorific burn and strengthen your heart. I still enjoy running and cycling but the rowing machine offers a huge array of benefits and it’s actually fun to do! This is the best budget rowing machine for beginners but it’s also an excellent choice for those more experienced rowers. To be fair the price is on the higher side for a budget machine but the investment is worth it. The Concept2 Model D is a well built machine that is certain to last you for years to come. It’s solid enough to give you a tough workout without creaking and moving round your floor. Concept2 have been making fitness equipment for over 40 years. They are based in Vermont, USA and have become known for their air resistance indoor rowing machines which are used for training by competition rowers. This is a company that knows what it’s doing! The Concept2 Model D uses air resistance technology to give you the most authentic rowing experience possible. It is noticeable different to other machines. Air resistance works by creating an air flow over a wheel; which is set inside the rowing machine. The more you spin the wheel the more air resistance there will be. The wheel is attached to the chain that you pull; the harder you work the more resistance you’ll be able to generate. A great feature of air resistance rowers is that there are very few things that can go wrong with them; you just need to oil the chain every so often. A great feature on the Concept2 Model D is the performance monitor that comes with it. You can choose to simply row or you can select from a variety of programs including workout and games. This small unit mounted next to the wheel housing is easy to see and will keep you informed of your heart rate, calories burned, distance, speed and the time you’ve been working out for. You can even remove your data via a USB drive and review it on your computer. It is worth noting that the heart rate monitoring is done via a wireless tracker; you’ll need a compatible heart rate monitor. If space is an issue in your home then you’ll be pleased to discover that the Concept2 Model D splits in the middle. This will allow you to store it as two halves. To help with this it has transport wheels. It is also worth noting that the monitor arm and foot rest are adjustable. Combine this with the well padded seat and you’re virtually guaranteed to find a comfortable position; regardless of how big or small you are. 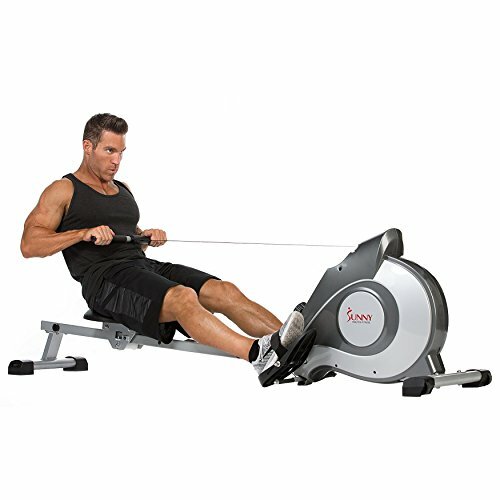 It’s not surprising that a company with this much experience has managed to create a rowing machine that is stable and well made. The basis of this is actually the fact that the design is so simple. In effect there are two sections connected in the middle. The framework is steel to keep it firmly in place even when rowing hard. Air resistant rowing machines are noisier than magnetic ones. This may be a consideration for anyone hoping to row while catching up on their television time. It could also be an issue if you’re planning on rowing in the same room as family members watching television. This is the best budget rowing machine because it offers great value, will last for years and the resistance is based on the effort you put in. But, it must be noted that this is at the higher end of most people’s budget. In truth, the Concpet2 Model D is worth it. The Sunny Health & Fitness SF-RW5515 is at the other end of the scale to the Concept2 Model D; in terms of price. This makes it the best budget rowing machine for anyone on a really tight budget. But, paying less doesn’t mean this machine isn’t good at what it does! Sunny Health & Fitness is a distributor of health and fitness equipment and have been in business for over 15 years. They have a straightforward approach to everything they sell; it must be affordable and high quality. That certainly applies to the SF-RW5515. The SF-RW5515 is nearly 7 feet long but this works in its favor. The length means that you can use this rowing machine regardless of how tall or short you are; you’ll still be able to reach maximum stretch. The magnetic resistance is controlled by a knob at the centre of the console; it’s easy to do as you row if you want to. With 8 different levels you should have no problem finding the right intensity for your workout. The feedback on the console is limited but will give you calories burned, time spent exercising and the count of your rowing movements. This is probably enough for most beginners who are looking to improve their fitness and strengthen their body. It’s very easy to store the SF-RW5515. Simply tip the seat up and release the pin at the base of the seat. Then lift the long bar upwards. The footprint of your rowing machine will instantly shrink; allowing you to store it anywhere you want. The console will give you a few basic readouts, such as your distance, time and calories burned. But that’s it. There is no heart rate monitor function and no way of saving your data to review later. The warranty is just 90 days and covers the frame and parts. This is very short considering their dedication to providing the highest quality exercise machines. There is no doubt that the Kettler Favorit is a stylish looking machine. It’s best to describe this as a mid range machine and, unlike the previous 2, this one uses hydraulic resistance. In essence this is oil in a piston which provides you with resistance as you pull it in and out. Kettler started business in Germany as long ago as 1949! They’ve been operating in the USA for 30 years and they are dedicated to providing high quality products. There are six functions monitored and displayed by the onboard computer. The nicest thing about this is the fact that they are all displayed at the same time. This means no more staring at the screen for several minutes to check all your date; one glance is enough. Information displayed includes time, calories burned, strokes completed, pulse rate (via the earlobe clip), distance and frequency rate. You can then get a cardio wellness grade which will help you to monitor your progress. The resistance on this machine is controlled by the hydraulic pistons. There are two of them. To adjust the resistance you’ll need to move the piston clamp from one of the marks to another. You can even change the resistance level on each oar, allowing you to focus on one side if needed. 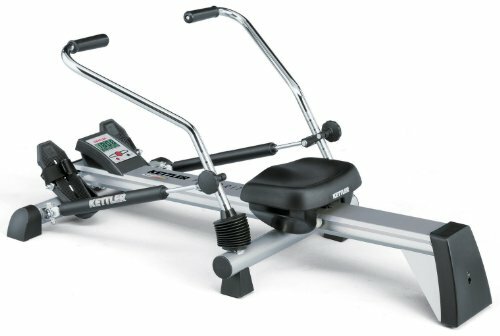 The Kettler Favorit is the smallest best budget rowing machine but it stills offers a comfortable seat and a good range of movement. You may find it an issue if you’re over 6 feet tall as you’ll feel cramped and unable to reach full stretch. However, the small footprint does mean it’s easier to store the Kettler Favorit when you’re not using it. The hydraulic principle is a good idea but you’ll notice a sharp drop in resistance once the oil inside the pistons has warmed up. This can be a real pain if you’re in the middle of an intensive workout; especially because it can take as much as half an hour for the oil to cool back down and the resistance level t return to normal. It is also worth noting that the process of changing the resistance level is not the easiest and certainly can’t be done while you’re on the machine. Your final choice will be based on the budget you have available and which features are most important to you. 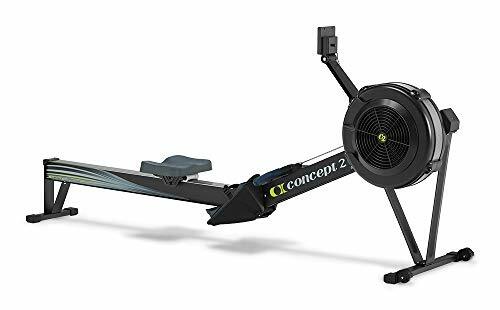 For me the best budget rowing machine has to be the Concept2 Model D. It offers reliability, an excellent warrant, a solid workout and will always keep pushing me harder thanks to the air resistance feature. It may not be the cheapest of the best budget rowing machine choices but I’ve now got the Concept2 Model D and I won’t be changing it any time soon. Exercise Bike vs Treadmill: Which Should You Use?